As there were few accurate maps it became the custom, and was even ordered by Elizabeth I, to beat the bounds of the parish annually. These were often colourful occasions, full of hymn singing and chanting. Marks were made appropriate trees and buildings and, where necessary, the procession took to the boats to follow the boundary in mid-Thames. 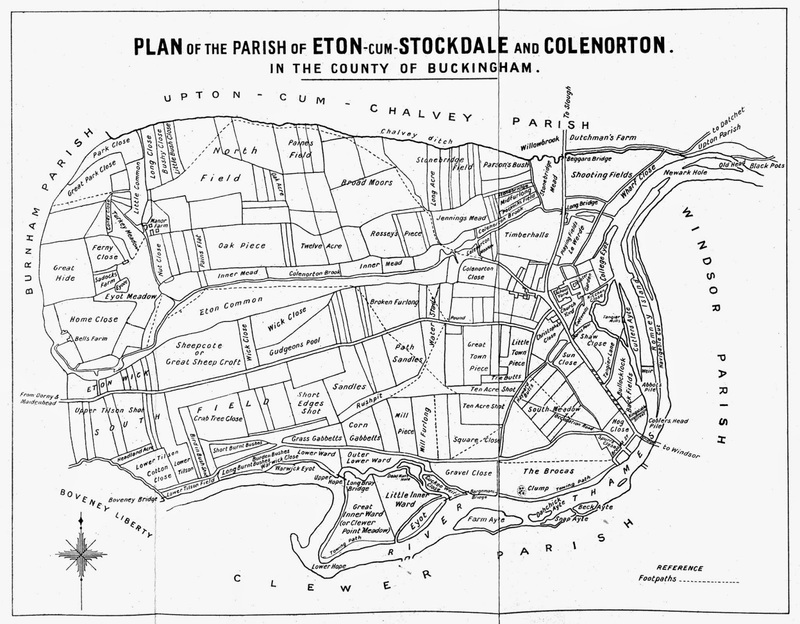 Exactly when the parish boundary was first defined is not known, but the route taken in 1605 can still be recognised as basically that of the ecclesiastical boundary before the addition of Boveney in 1911. 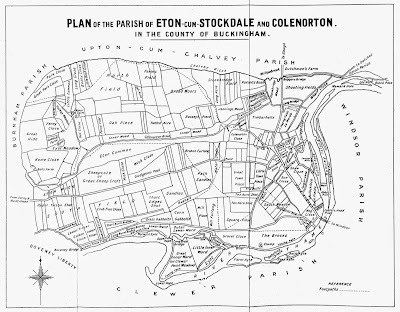 The parish was much smaller than that of the pre-1974 Eton Urban District and the present Town Council area. The 1605 perambulation is given below and where appropriate the modern place names have been added in brackets. It is difficult, however, to interpret what the surveyor meant by the farms, for the two farmhouses mentioned did not lie near the parish boundary. Perhaps he only meant to imply the farmland. The surveyor stated, 'Beginning at the Church (College Chapel) we go to Windsor Bridge and taking the lane (possibly Brocas Street) by the house of Robert Payne, we go along the Thameside up as far as Tyilstone Gate (possibly by Boveney Bridge or across the road opposite the Village Hall) and then to the farm of the King's now in the occupation of Matthew Bell (Mustians) from where we go to another in the Wick occupied by Henry Bell (Saddocks) and so we go into Little Common as far as Dragon Elm, we go along the North Field and Chalvey Ditch until we come to a bridge near College called Stone Bridge. Then encompassing the College land called Shooting Field, Wharf Close, the Playing Fields and the College, we come to the Church where we first began'. A further account of a perambulation, this time of 1815, describes the procession as consisting of the Rev Mr Roper (as chaplain to the Provost), the Steward of the Manor, the parish officials, the charity children and inhabitants. Their day began with breakfast of roast and boiled beef provided by the Provost and Fellows, and they probably needed it, for although Eton is a comparatively small parish the walk and boat ride must have taken several hours. At one point the procession 'went through the door of the house of William Lanfear and out through another. Almost certainly this was one of the Bell Farm cottages which stood until 1969 at the junction of Bell Lane and Alma Road. Their gardens straddled the boundary and in the nineteenth century they were sometimes included in the Census of Boveney and sometimes that of Eton.